Korey Smith scored a stoppage time winner to knock the holders Manchester United out of the Carabao Cup. Bristol City defended valiantly throughout, and their place in the last four is just reward for a ferocious performance, despite a distinct difference in quality, price and class. Lee Johnson spoke in the week about his wish to “pick Jose Mourinho’s brains” after the game, but it was prior to the match where the well travelled Portuguese manager showed him the finest mark of respect, by selecting Ibrahimovic, Martial and Pogba in a strong United team. 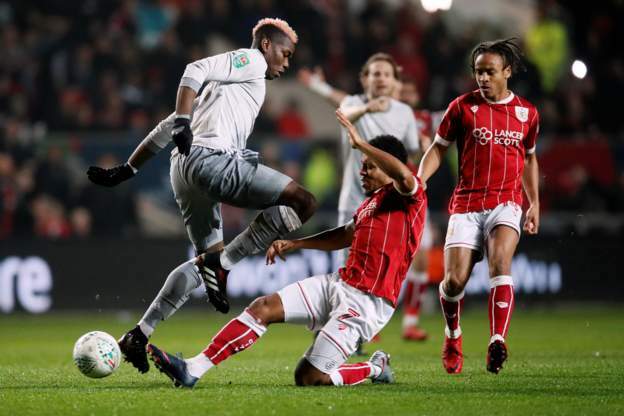 Buoyed by a cacophonous home crowd, Bristol City began the game with pace and intensity, though a strong Manchester United team were able to cope with any early attacks the Championship side could muster. For all City’s early panache, it was Manchester United who came closest in the early exchanges, with Zlatan Ibrahimovic’s early effort deflected onto the crossbar, while Marcus Rashford hit the post just minutes later. Pogba also came close with a curled effort from distance. 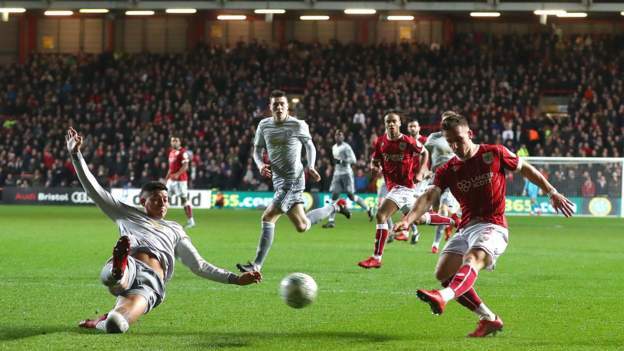 Bristol City initially struggled to create chances against a potentially shaky United back four, though they came close just before the interval through Korey Smith. He broke into the United 18-yard-box after a cute backheel from Bobby Reid, but Dutch centre-back Daley Blind was able to catch up and eliminate the goal threat. Smith would have another opportunity later on. Paul Pogba, returning from a three-game domestic ban for a horror tackle on Hector Bellerin, found himself in the spotlight once again for a questionable challenge, this time on City midfielder Nathan Baker. The Frenchman’s studs drove into the knee of Baker long after the ball was gone, and could count himself lucky that referee Mike Dean failed to spot it. Mourinho’s men began the match in lethargic and timid fashion, and the second period was exactly the same. City left back Joe Bryan performed an exquisite piece of skill in the middle of the field, chipping the ball over Daley Blind, before the ball found its way to Marlon Pack in space. Bryan then capitalised on Blind’s absence, rocketing up the centre of the pitch, before thumping a left-footed finish past Romero. Only minutes later, Bristol City’s bubble was burst. After Mike Dean gave United a free kick just outside the area, their Swedish striker battered a finish into the bottom corner, though the original contact on Pogba which resulted in the free kick looked minimal. Despite this setback, the Ashton Gate crowd remained buoyant and supportive, but Jose Mourinho was able to call on Romelu Lukaku after an hour. An attacking force consisting of Lukaku, Martial, Rashford and Ibrahimovic would trouble most teams worldwide, but Bristol City were solid defensively. Joe Bryan remained at the centre of the action, and eliminated a United counter attack by tackling Marcus Rashford brilliantly, despite his numerical disadvantage and Mkhitaryan offering a second option. Despite a largely chanceless second period, Ashton Gate was sent into delirium in stoppage time. City sent numbers flooding forward, and Manchester United’s arrogance was fully shown in their lack of collective defending when a place in the Carabao Cup semi-finals was up for grabs. It was Korey Smith who sent himself into Bristol City folklore, by volleying his club into a semi-final draw with Arsenal, Manchester City and Chelsea.